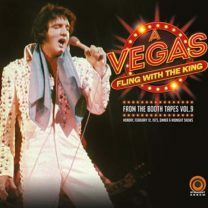 “A Vegas Fling With The King” è il titolo del nuovo doppio cd della Straight Arrow’s per la serie “From The Booth Tapes“. Contiene entrambi i concerti del 12 febbraio 1973, dinner e midnight show, a Las Vegas. La registrazione degli spettacoli proviene direttamente dalla cassetta e ha una qualità audio molto buona. Il tutto presentato in una confezione digipack a 4 pannelli con rare foto della winter season, sul palco e nel backstage. 01. Introduction: Also Sprach Zarathustra – 02. C. C. Rider – 03. I Got A Woman / Amen – 04. Love Me Tender – 05. You Don’t Have To Say You Love Me – 06. Steamroller Blues – 07. You Gave Me A Mountain – 08. Fever – 09. Love Me – 10. Blue Suede Shoes – 11. Heartbreak Hotel – 12. Johnny B. Goode – 13. Hound Dog – 14. What Now My Love – 15. 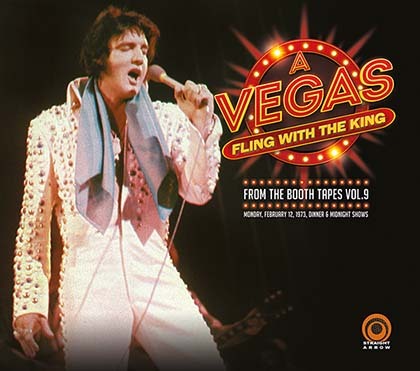 Suspicious Minds – 16. Introductions of singers, musicians, orchestra – 17. Introduction of actor Jack Lord / Hawaii 5-0 theme – 18. I’ll Remember You (dedicated to Jack and Marie Lord) – 19. I Can’t Stop Loving You – 20. An American Trilogy – 21. Can’t Help Falling In Love – 22. Closing Vamp / Announcements. 01. Introduction: Also Sprach Zarathustra – 02. C. C. Rider – 03. I Got A Woman / Amen – 04. Love Me Tender – 05. You Don’t Have To Say You Love Me – 06. Steamroller Blues – 07. You Gave Me A Mountain – 08. Fever – 09. Love Me – 10. Blue Suede Shoes – 11. Heartbreak Hotel – 12. Johnny B. Goode – 13. Hound Dog – 14. What Now My Love – 15. Suspicious Minds – 16. Introductions of singers, musicians, orchestra – 17. Introduction of actor Jack Lord / Hawaii 5-0 theme – 18. I’ll Remember You – 19. I Can’t Stop Loving You (with reprise) – 20. An American Trilogy – 21. Can’t Help Falling In Love – 22. Closing Vamp.